CBA's portfolio view on the new app. Initially launched for Android users, the iOS version is “days away,” said CBA CIO for retail and wealth Pete Steel. “What we are seeing in the evenings is that a lot of customers are using tablets. Tablet banking continues to grow in popularity and we wanted to update our existing tablet app with a brand new design to meet the changing needs of our customers,” he said. 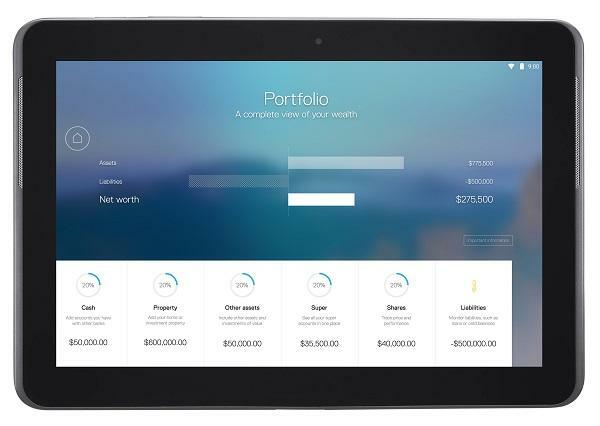 The Portfolio View allows customers to view all of their CommBank accounts together, including property, shares and super. They can also add, update and remove assets and liabilities from other banks via NetBank. Using the app, customers can transfer between accounts, make payments to third party accounts and reschedule or delete future transactions and payments using a transactions screen. “We found that a lot of customers live pay packet to pay packet and they have peaks and troughs in their cashflow. That’s not a bad thing as long as you are aware what is happening,” said Steel. For example, customers can see an up-to-date overview of their daily spend and closing balance for the last 35 days in one graph. There is also a savings tracker screen so customers can work out their pay schedule and where they can potentially make savings. In addition, there is a transaction visualisation screen where people can view where and how they are spending with a snapshot of their transactions. In June, CBA unveiled two apps for the Apple Watch – one aimed at consumers and the other at CommSec trading customers. The CommBank app for smartwatches includes an ATM locator, account balances and Cardless Cash option which allows consumers to withdraw funds from CBA ATMs without using their ATM card. CommSec customers can view live share market information on the CommSec Apple Watch app. For example, customers can look at share portfolio, individual share holdings and cash balances.